When Caroline at Beauty is a Sleeping Cat and Karen at Kaggsy’s Bookish Ramblings declared a Hermann Hesse Reading Week I was intrigued to take part. I’d read a great deal of Hesse’s work in my twenties but little since; it seemed an opportunity to reacquaint myself with a writer who had once been (and perhaps still would be) one of my favourites, and was certainly among my earliest introductions to literature in translation. My first instant was to reach for the old Penguins and Picadors lying rather neglected on my book shelves, but a quick check told me there was one Hesse novel which I had not yet read, an early work for 1910, Gertrude, still in print from Peter Owen in a translation by Hilda Rosner. Only when he receives the friendship and support of the singer Heinrich Muoth does his career as a composer begin to take off. Muoth provides a contrast to Kuhn, extrovert and charismatic, yet somehow never at peace with himself, and plays an important part in Hesse’s real theme, the destructive nature of love. Lottie laughs at his innocence; he finds it difficult to reconcile his friendship with behaviour he finds contemptable. The narrator himself is soon to fall in love with a young woman called (you guessed it) Gertrude. You may also have guessed that he is at first reluctant to trust his own feelings, and then to share them (when he eventually does, it is in a letter). Hesse goes on to create a series of unequal relationships between four of his characters – Muoth, Gertrude, the narrator and Brigitte, the daughter of a friend – in a way that we might associate with a Shakespearian comedy, except Hesse doesn’t find anything funny about it. Hesse did not regard Gertrude as one of his better books. In attempting to combine a number of different themes, Hesse struggles for clarity and fails to achieve synthesis. A long section on his mother after his father’s death seems to add little to the narrative. Always reluctant to take the initiative, Kuhn is frequently waiting for something to happen, but as the reader is usually one step ahead of him, there is little tension. 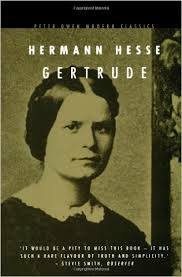 Gertrude, then, is not the first Hesse novel to pick up, but it is an interesting signpost of the path he was on. You are currently browsing the archives for the Hermann Hesse category.